Do I have to fill out a Processing Acknowledgement Form (PAF)? Our TrueNCOA registration form is used to automatically fill out a PAF for our users. 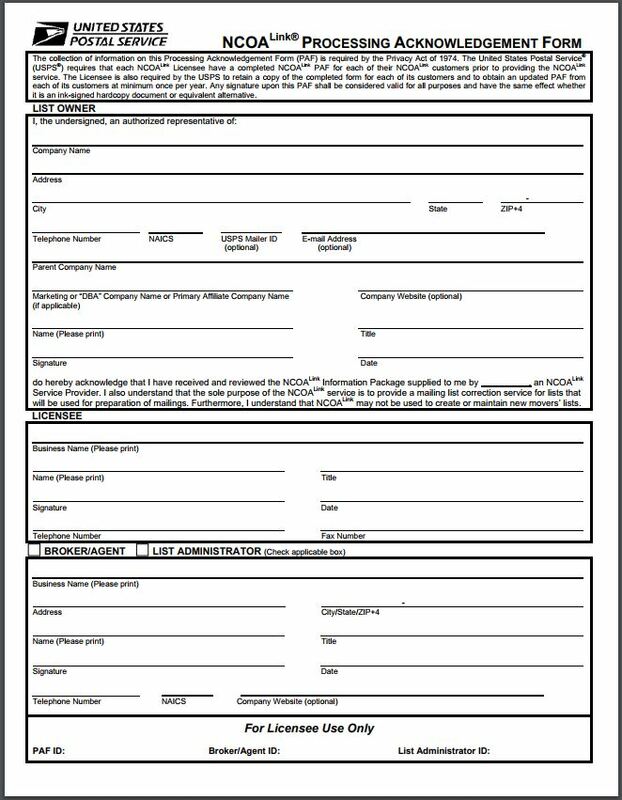 NCOALink® Licensees are required by their license agreement to acquire Processing Acknowledgement Forms. Because of this, TrueNCOA collects Processing Acknowledgement Forms for each of their customers. The PAF indicates that mailers, like you, understand that the use of the COA data is restricted. In addition, licensees are also protected by the form if a mailer abuses the intended use of the product. In summation, TrueNCOA automatically creates this form for you, but if you prefer to have one, feel free to fill it out, and send it our way! If you are interested in reading more about the Processing Acknowledgement Form, see: What exactly is a Processing Acknowledgement Form?